Rub the steak with a little olive oil, salt and pepper and sear on both sides in a really hot pan, to the way you like to eat it, remove from the pan and rest it for at least 10 minutes before slicing it up to retain all the lovely juices. Heat the olive oil in a frying pan and add the dried mushrooms, fry for 2 minutes and then remove them from the pan. Remove the stems from the fresh mushrooms and slice, keep them separate from the caps, slice the caps. Add the stems to the pan, fry for 2 minutes and then add the fresh rosemary, garlic and olive oil with the caps and cook for a further 2 minutes and remove from the heat. For the dressing, whisk together the garlic, mustard, vinegar and olive oil and then add the chopped parsley, lemon zest, and season with salt and pepper. Combine the fresh and dried mushrooms. 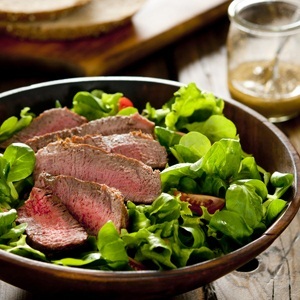 To assemble the salad, layer the steak, mushrooms and rocket with the dressing on a platter. Garnish with shaved parmesan and thinly sliced red onion. Recipe reprinted with permission of Jenny Morris from Jenny Morris Cooks the Riviera.